CPA, or cost per action, is a pure performance pricing model in which marketers pay media sources a fixed amount based on a pre-specified action. Unlike CPI, which relies on attributed user installs to achieve campaign conversion, CPA can be chosen from many different post install in-app actions, such as registration, app launch, and item purchase, among others. The value of CPA is simply the price an advertiser pays a media source for each pre-set action (i.e. purchase, registration, etc.) that is driven by that source. For a broader look at how a given ad network may be performing, you can calculate the eCPA, or effective cost per action, by dividing the total cost incurred from that network by the total number of specified actions based on a pre-selected time range. This metric will include any/all campaign CPAs you wish to measure and gives you the overall picture of advertising costs on the media source level over time. As marketers have become increasingly more sophisticated with their resources, tools, and methods, demand also increased for a pure performance model that allowed them to pay as close to the desired end result as possible. Additionally, the CPA model helps media sources receive advertising budgets from performance marketers who may previously have been hesitant to spend money on advertising that is not directly associated with actual value. For this reason, pricing models evolved from the more vanity-driven cost per mille (where marketers paid a set price for a thousand impressions) to cost per click (where users begin to express some intent by clicking on an ad) to cost per install, which is a significant step in the funnel but does not ultimately guarantee revenue generation. In fact, most installers will not make a purchase and/or become loyal users who monetize via ads. CPA is a direct reflection of the profitability of campaigns that leaves a minimal amount of cost risk with the marketers, making it an obvious choice among the models currently available. Conversely, while desired among marketers, CPA is offered by networks as a pricing option only in a minority of instances, since the networks themselves carry most of the risk associated with low conversion. This is because the ad networks must purchase the ad real estate before users have converted and marketers have paid conversion costs. In the mobile ecosystem today, the reality is that CPA is not readily available as a pricing model for the reasons explained above. Nonetheless, while the majority of marketers find themselves paying for CPC or CPI, they (or performance-driven media sources) will still optimize internally towards eCPA to focus their campaigns and ad networks on the highest profitability potential. 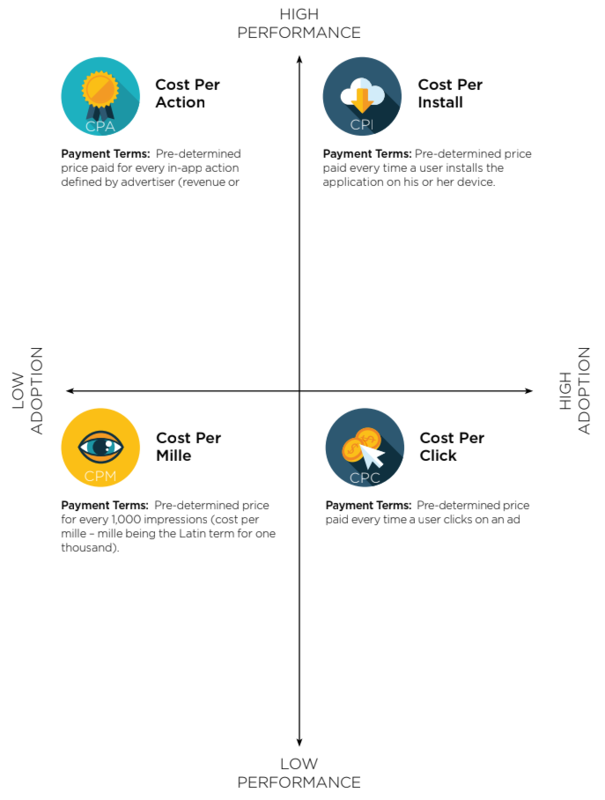 While CPA still doesn’t have a strong presence as a frequently used pricing model, the metric undoubtedly guides both performance-driven marketers and media sources to focus on the quality of their users and deliver more sustainable results in the long run.